ABC NewsPaul Ryan speaks to ABC News. 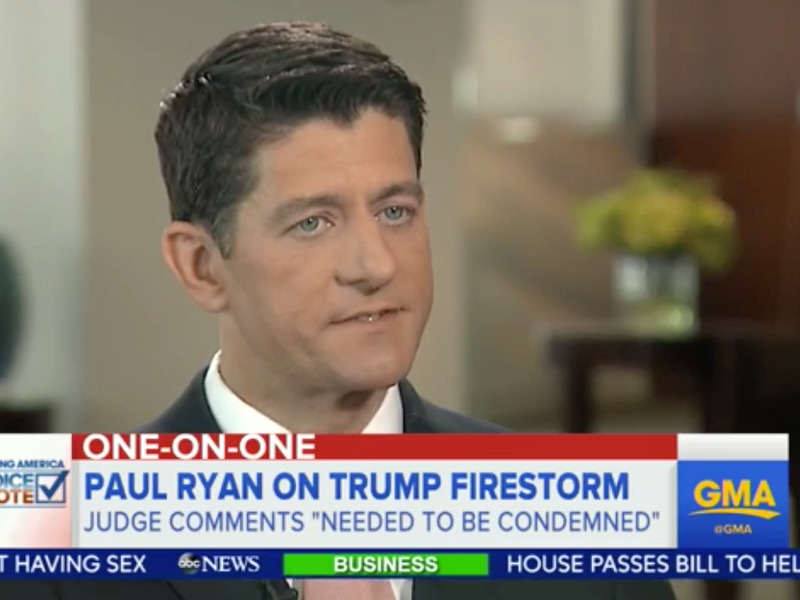 House Speaker Paul Ryan said in an interview set to air Sunday that he privately “explained” to Donald Trump “exactly” how he felt about recent attacks the presumptive Republican nominee has launched on a federal judge. “I have, and I’ve explained exactly what I thought about that comment. I said it publicly and I said it privately,” Ryan told ABC News anchor George Stephanopoulos in a clip of the interview. A spokesperson for Ryan’s office told Business Insider that Trump called Ryan and the two had a conversation about the comments. The Manhattan billionaire has repeatedly said US District Court Judge Gonzalo Curiel’s Mexican heritage made him unfit to oversee cases involving Trump University. The presumptive Republican nominee argued there was a conflict of interest because he favours building a wall and Curiel’s parents are from Mexico. Curiel is an American and was born in Indiana. Ryan has tried to move Trump away from such comments and more toward a policy-oriented campaign. “Look, we want to offer the country a clear and compelling choice so that we can earn a mandate from the nation to fix our country’s problems, a those kind of comments get in the way of that kind of dialogue we need to have with our fellow citizens,” the Wisconsin Republican told ABC. Stephanopoulos asked Ryan about whether Trump understands the backlash his comments about the judge have caused. Trump may have seen some of the backlash against his remarks in the latest Fox News national poll. The real-estate mogul dipped six points from last month, trailing Democratic rival Hillary Clinton by a 42% to 39% spread.